Group discounts are available to parties of 20 or more paying visitors. Free entry available to guests who are under the age of a junior high student, who are over 70, and those who possess a physical disability certificate, rehabilitation certificate, mental disability certificate as well as their caregiver. Free entry also available on Family Day (third Sunday of every month), Culture Day (November 3rd), and Community Day (February 7 th). First Saturday of April to August 31st　5:30 a.m. ～ 8:45 a.m.
September 1st to October 31st　6:00 a.m. ～ 8:45 a.m.
※Early entry only permitted through the east gate. 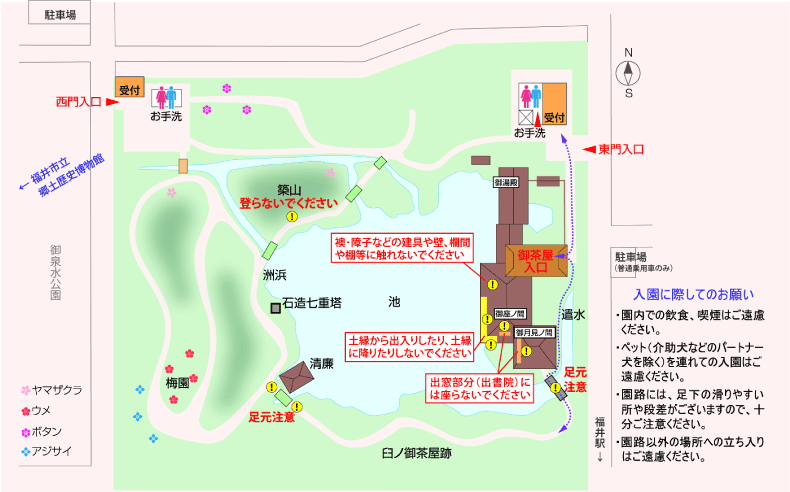 ※Early entry only applies to the garden; entrance to the manor house must be done during normal operating hours. Eating, drinking, and smoking are prohibited within the park. Pets are not allowed in the park (excluding service dogs, etc.). Beware of slippery or uneven places when walking along the garden path. Entrance into areas outside of the garden path is prohibited. Touching or moving fixtures, such as paper sliding doors, walls, transoms, shelves, etc. in the building is prohibited. Do not enter/exit from the earthen floor into/out of the building. There is a designated entrance on the east side with shoe racks. Do not step onto the earthen floor from the sitting rooms in the building. Do not sit on the bay windows in the study area.